Click here to be notified by email when Arduino Uno R3 (Latest Revision) becomes available. 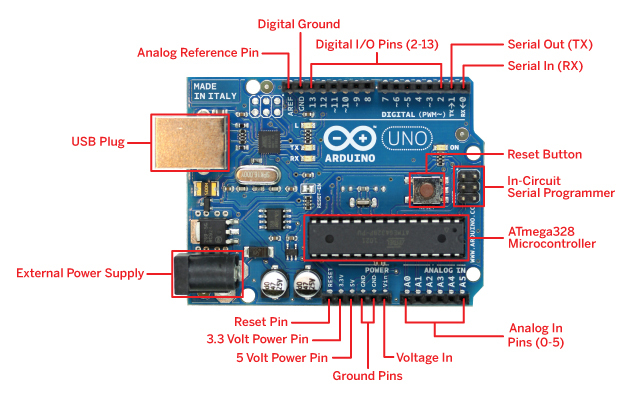 Arduino Egypt now stocking the latest Arduino UNO Revision 3. The arduino UNO R3 is backwards compatible with the UNO - same driver, same uploading, same look. ATmega16U2 instead of the 8U2 found. This allows for faster USB transfer rates. The ability to have the Uno show up as a keyboard, mouse, joystick, etc. New SDA and SCL pins next to the AREF. this is a duplication of the Analog 4 and 5 pins. Two new pins placed near the RESET pin. One is the IOREF that allow the shields to adapt to the voltage provided from the board. The other is a not connected and is reserved for future purposes. Reset button moved from center of board to corner near USB connector, allowing resets when shields are connected.